This is something that is not talked about often, at least not more than passing. While there are phones that are over Rs. 40,000 and are the prodigal children of the companies. The flagships that offer you the world – Quad core processor, 2 GB RAM, a huge screen and what not. And then there are phones that hold the promise of providing Android to everyone. The barrier of owning a smartphone is currently merely Rs. 3000. That is the price where Micromax Bolt A27 and Josh Fortuna Square lie. In perspective, Nokia Asha 205 (cheapest Asha Phone) is around Rs. 3500. I have added Samsung’s Galaxy Ace for reference. It is the phone that I owned a year and a half back. Also, this is one of the currently used phones in my family. The phone is working perfectly and you can play Angry Birds on it. In fact, when I bought it for Rs. 15000 it was one of the best out there. Now, phones that have arguably similar hardware specs are priced at a mere Rs. 3000 mark. Don’t get me wrong, Ace would in all probability perform better than these two. The quality of processor etc. matter but still, the difference would not be that huge that these two phones will stutter. In today’s quad-core frenzy we forget that Android runs quite smoothly in 1 GHz processor and with subsequent iterations Google is actually trying to reduce the hardware requirements. The only glaring difference is the Camera which is pretty obvious as it is one of the costlier components of any phone. The point I want to make is that these phone would not be slow and painful to use, at least not because of the hardware. That brings me to second point. I believe that the primary reason why the phones at these price ranges act slow is because probably the company did not work on the software enough. If the tweaking is done aptly, Android will run quite smoothly on these phones. It still runs pretty well on my Ace. It is really heartening to see that the price point for smartphones have reached almost equivalent to feature phones. While companies can make a lot of margins in the high end segment, it is this low end segment where the reach of smartphone helps the people on ground level and supports development of India. 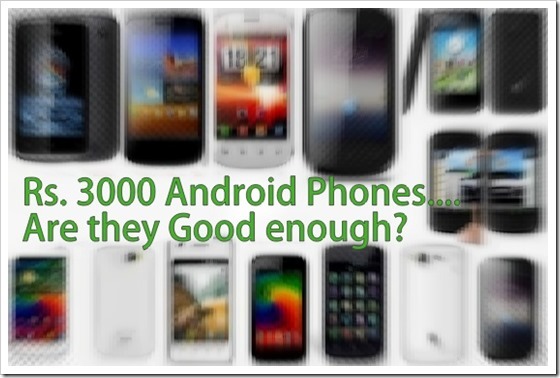 Bottom-line is, if software on the phone is tweaked, and if specs on camera can be compromised, nothing stops a a INR 3000 Android phone to satisfy most of the mobile user’s need.